The fusebox shown (sideways) is the one on the passenger's side. 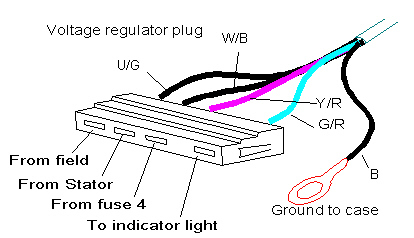 The power that comes via the tachometer originates at the 3rd fuse down on that fusebox. Note that the connections on the two variations of alternator are similar, but their relationship to the mounts is different. 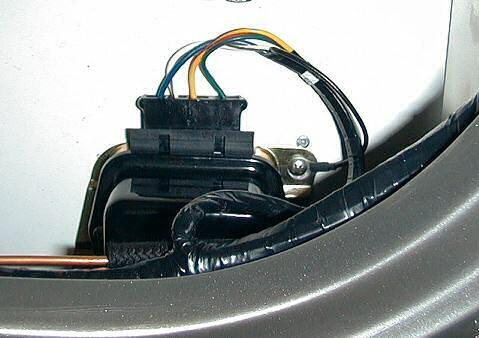 Wires are inserted into the voltage regulator plug as shown. Note the extra space between the 3rd and 4th connections. Make sure that the regulator is well-grounded, and that the ground on the firewall below the starter solenoid (#32) is good. Remove the plug from the regulator and (with the ignition on) check that you've got 12V at the Y/R wire.